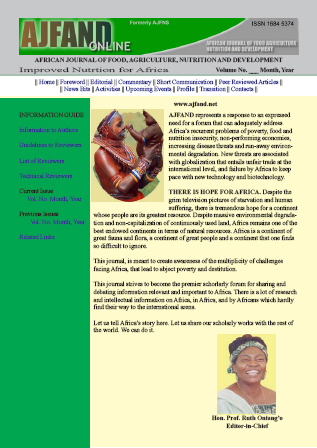 Iron deficiency and undernutrition often co-exist among children and the prevalence in sub-Saharan African is high. In Burkina Faso, 92% of children under the age of five years were anaemic and 39% were stunted in 2003 according to Demographics and health survey. Risk factors include inadequate dietary intakes and infections that often occur concomitantly. Orphans and vulnerable children who are already at increased risk for poor psycho-emotional development due to their social status are particularly susceptible to malnutrition. Therefore, there is a challenge to develop effective interventions that address the multiple risk factors of nutritional deficiencies in these children. An integrated nutrition intervention including dietary modification and changes in hygiene practices was implemented targeting a group of preschool orphans and vulnerable children living in group foster homes. The amount of iron-rich foods particularly goat meat and condiments as well as citrus fruits were increased in the diet. The hygiene component of the intervention focused on handwashing, eating in individual plates, food storage and stool disposal. All members of the foster homes at large benefitted from the activities of the intervention; however, measurements and impact evaluation focused on preschool children (12 - 72 months). Energy and nutrient intakes, anthropometric indices and morbidity including diarrhoea, fever, vomiting and respiratory infections were assessed at baseline and after 18 weeks. Mean bioavailable iron intake was increased from 0.4 to 0.9 mg/d. The intervention resulted in a decrease in the prevalence of inadequate intakes for energy, proteins and most micronutrients. The intervention increased the meat-fish-poultry contribution to energy and iron intakes from 1.6 to 3.5% and from 5.2 to 7.9%, respectively. There was also a decrease in the incidence of infection (from 73 to 9%, p<0.01) and overall morbidity (from 39 to 15%, p<0.05) most likely due to deworming and improvements in hygiene behaviours. Contrary to baseline, helminths such as Hymelolepis nana , Strongyloïdes stercoralis and Necator americanus that often cause blood loss were rarely found at the end of the intervention. The overall changes resulted in improvements in height-for-age z-score (-1.63 to -1.27, p<0.01) and weight-for-age z-score (-1.22 to -1.06, p<0.05). In conclusion, an intervention that targets bioavailable iron and hygiene behaviours improved child growth, iron status and overall morbidity in areas of high incidence of infection.